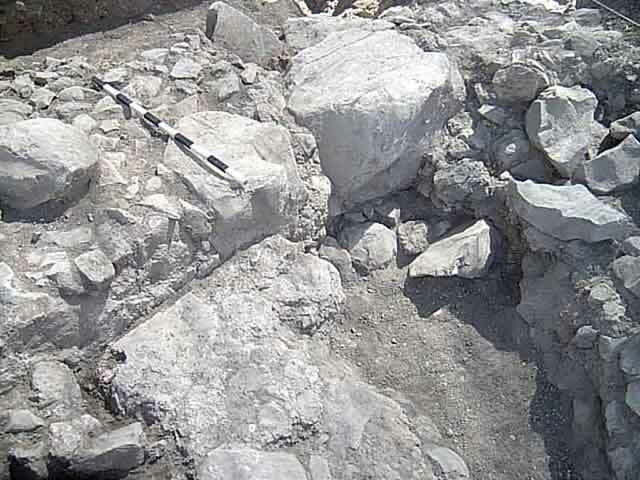 During September–October 2003, a salvage excavation was conducted north of the Dabayib et-Tuwal site, southeast of Kibbuts Hamadya (Permit No. A-3987; map ref. NIG 24930–40/71340–5; OIG 19930–40/21340–5; ESI 9:172), after ancient remains were damaged when a communications cable was installed. The excavation, undertaken on behalf of the Israel Antiquities Authority and underwritten by the Kave Zahav Company, was directed by W. Atrash (photography), with the assistance of Y. Ya‘aqobi and D. Avshalom (administration) and T. Meltsen (surveying and drafting). The excavation was conducted along the eastern edge of the Bet She’an–Tsemah road. Two excavation areas (A, B; Fig. 1) were opened. A square (3 × 5 m) was excavated in the eastern Area A and part of an agricultural installation was exposed. Two squares were excavated in the western Area B, closest to the road, revealing a built water reservoir that dated to the Byzantine and Early Islamic periods. The installation and reservoir were built along a stream channel that extends from west to east. Area A (Figs. 2, 3). Two walls (W101, W111) that formed a corner were exposed. Wall 101 (exposed length 5 m, width 1.4 m), founded on travertine bedrock, was oriented north–south. Built of large undressed basalt stones with smaller basalt stones between them, it was preserved to maximum two courses high, extending beyond the limits of the excavation. The western face of the wall was coated with hydraulic lime plaster and the eastern face was incorporated into a floor bedding of small basalt stones (L102). 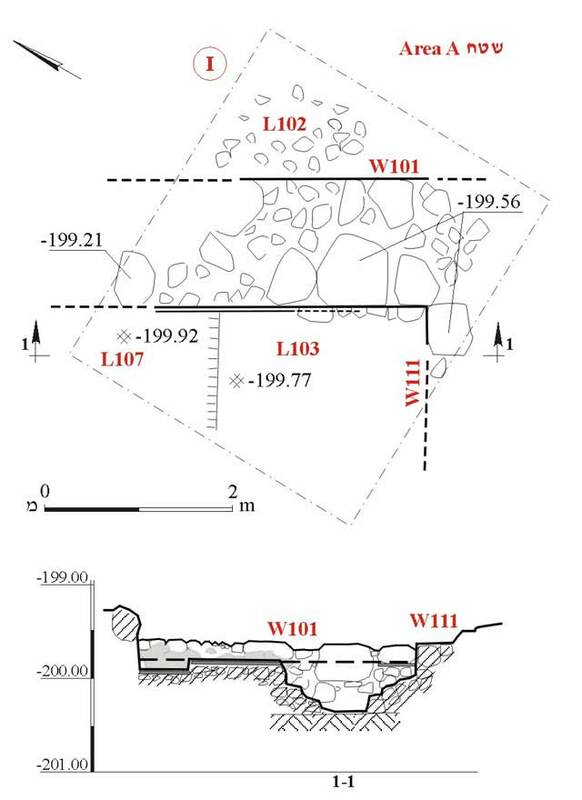 A small section of W111, also founded on travertine bedrock, was exposed. The wall was aligned east–west and its northern side was built similar to W101. 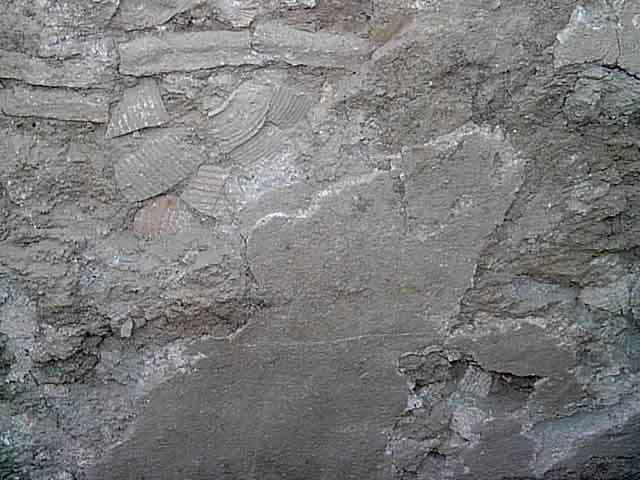 A floor (L107) of lime plaster was exposed between the two walls. The floor bedding consisted of basalt stones, placed on the travertine bedrock. Floor 107 was built in two levels, whereby the southern part was c. 0.18 m higher than the northern part. Basalt stones and gray soil collapse (L103) that contained a few potsherds from the Byzantine period was exposed on the floor. It seems that the walls and the floor were part of an installation connected with water, which dated to the Byzantine period (sixth–seventh centuries CE), based on ceramic finds. Area B (Fig. 4). 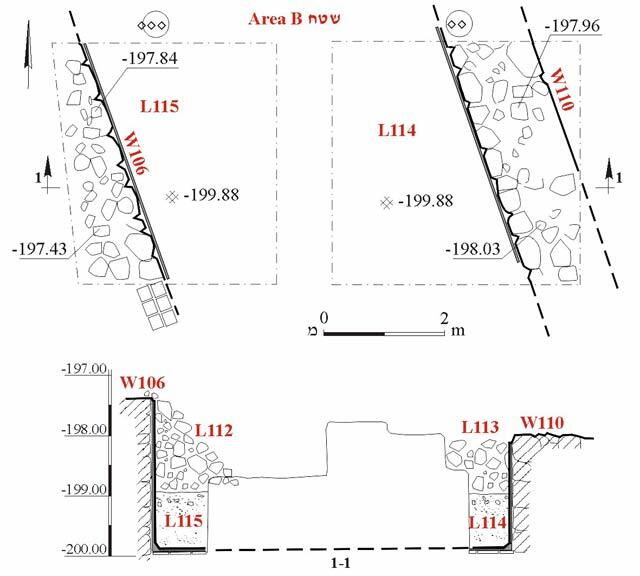 Two parallel walls of a water reservoir, 6 m apart, were discovered (W106, W110). 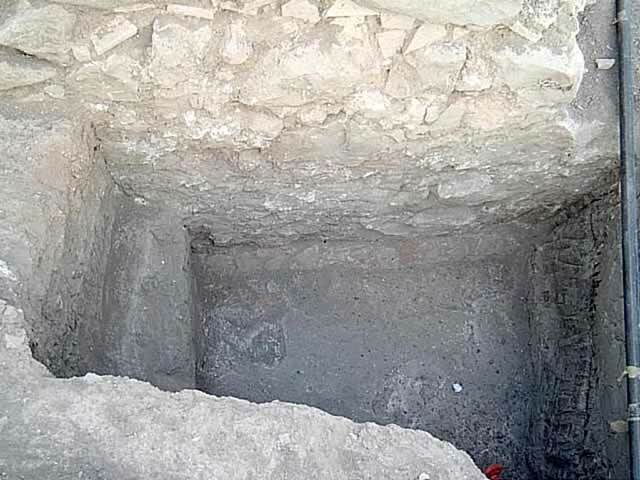 They extended beyond the limits of the excavation and thus the full width of W106 was not exposed. The walls, founded on travertine bedrock and aligned north–south, were built of basalt and mud bricks (Wall 106—exposed length 4 m, preserved height 2.45 m; Wall 110—exposed length 4 m, width 1.3 m, preserved height 1.92 m; Fig. 5). The western face of W110 and the eastern face of W106 were coated with hydraulic lime plaster, which was applied to a base layer of potsherds that dated to the Byzantine and Early Islamic periods (Fig. 6). The reservoir’s floor, which abutted both walls, was composed of mud bricks (0.22 × 0.22 m) that were coated with lime plaster. Gray alluvium, devoid of potsherds, was exposed on the floor (L114; thickness 1 m). Collapse from Walls 106 and 110 (Loci 112, 113) and several potsherds from the Byzantine and Early Islamic periods were found on the alluvium. A lump of travertine sediment was exposed in the southern part of W106, on top of the plaster. This sediment indicates the location of the reservoir's feeder channel, which apparently came from the west. It seems that the exposed remains in the area belonged to a large water reservoir (width 6 m, depth c. 2.5 m), whose length is unknown. Based on the ceramic finds, the reservoir was apparently used from the Byzantine until the end of the Umayyad periods (500–749 CE). 3. Area A, looking east. 4. Area B, plan and section. 5. The water reservoir, W110 and the floor, looking south. 6. Plaster remains and the potsherd base layer on the reservoir’s wall, looking west.